It’s October. The air is cooling and Daylight Savings Time and Halloween are upon us. October is a month of harvest. I’m not just talking about our burgeoning and waning vegetable gardens, I’m also talking about things like wine grapes, truffles and an item close to my heart and roots: Hatch Chili Peppers from Hatch, New Mexico. It turns out my dad is from Hatch. In the 40’s when he was born, it was a dirt-road one-horse kind of town. For those who may not know, Hatch is the chili pepper capital OF THE WORLD. This town has had a bit of a burgeoning of its own, and especially each year around this time. It’s a destination! There are large events there, like festivals, dedicated to the modest chili, and October is the time when the chilies are roasted or dried and ground and sold to many a happy customer worldwide. 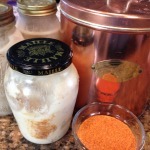 Hatch red chili powder is no joke in my family, nor is the family enchilada sauce recipe made from it or the enchilada-making approach that has been in our family for generations. 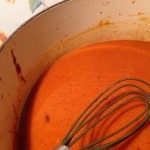 Anyway, we love our rich red spicy, smooth, flavorful enchilada sauce and when you make a batch (which is about 5 pints of sauce), you can store what you don’t use right away in the freezer or you can pressure can it, if you have a pressure canner ( I think I could write a whole post on how much I love my pressure canner – it’s this one). 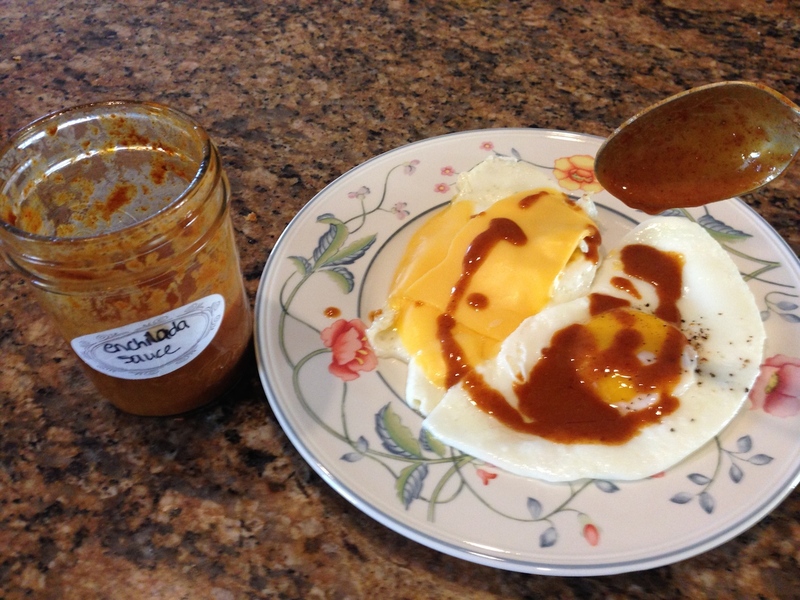 The deep and pure flavor of this sauce is something amazing, and I hope you try it. 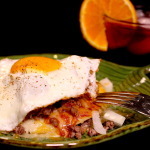 It’s outstanding on the family recipe (I’ll walk you through it below) for enchiladas and glorious on fried eggs (read more about eggs here) for breakfast. 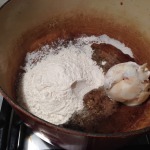 In a large Dutch oven at medium heat, melt the bacon fat and add the flour, whisking often, until the roux (flour and far together on the stove is called a roux – it’s a thickener) has thinned out a little and turned a warm brown color. 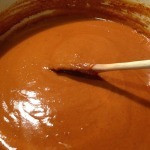 Whisk in the chili powder until smooth. Do NOT bend over the pot and breath in at this point: this is the equivalent if getting a spritz of pepper spray in your lungs (eek). 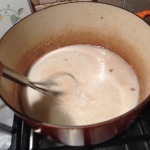 Whisk in 8 cups of chicken stock and simmer on low, stirring often, until it thickens. 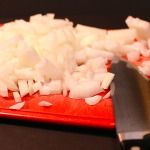 Taste it for seasoning and adjust as needed. 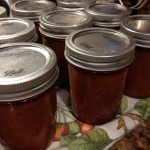 Store in the refrigerator for about a week, in the freezer for 6 months or canned for a year. 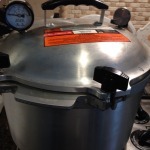 If canning it, do it in a pressure canner (45 minutes at 10 pounds for half pints if you live at sea level… if you live at a higher altitude, please consult the free app from Mother Earth News called HOW TO CAN for canning directions for chicken stock at your altitude). 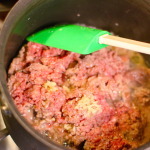 In a saucepan, cook the ground beef with the garlic and salt to taste, breaking it up often with a spoon or spatula, until no longer pink. Remove from heat and set aside. 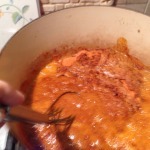 In a small skillet, warm 2 tsp oil until hot. 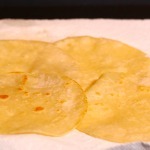 Heat each corn tortilla about 30 seconds on each side. Let them sit on the side on paper towels until ready to assemble the enchiladas. 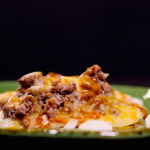 Top with about ¼ cup of beef, a sprinkling of raw onion, chees and enchilada sauce. 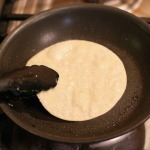 Top with another tortilla and repeat the toppings. Put the plate in the oven so the cheese can melt. Work on the next plate. When all plates are in the oven, fry the eggs sunny side up, top with salt and pepper, and place an egg on top of each enchilada. Serve instantly. 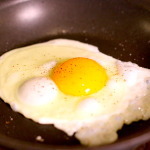 I have a hard time not doing the involuntary eye roll and satisfied sigh – thing when I take my first egg-yolk soaked bite. NOTE: These are instructions for a standard ‘double enchilada’. Everyone in my family has their own ‘way’ they like these – so feel free to modify to your taste. We have folks who eat triples or quads with double sauce, single with light sauce and 2 eggs, double with extra onion and no egg, etc, etc. 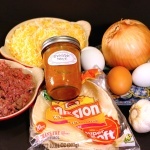 Time to make enchiladas again! Each time I feel so full that I wonder if/when I’ll want them again. But then someone says the word and the urge comes back! So easy when the sauce is in the pantry!! Thanks, A!!! Try to resist the urge to get extra hot chile. 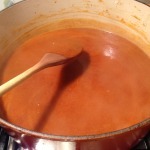 The sauce has much more flavor and all the other flavors come through when it’s not so hot. Yum!! This sounds delicious! 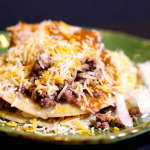 Being a lacto-ovo vegetarian, I think this will be an easy recipe to adapt, while maintaining the basic flavor of these enchiladas. I will stick to a milder version. I can’t wait to try this!! 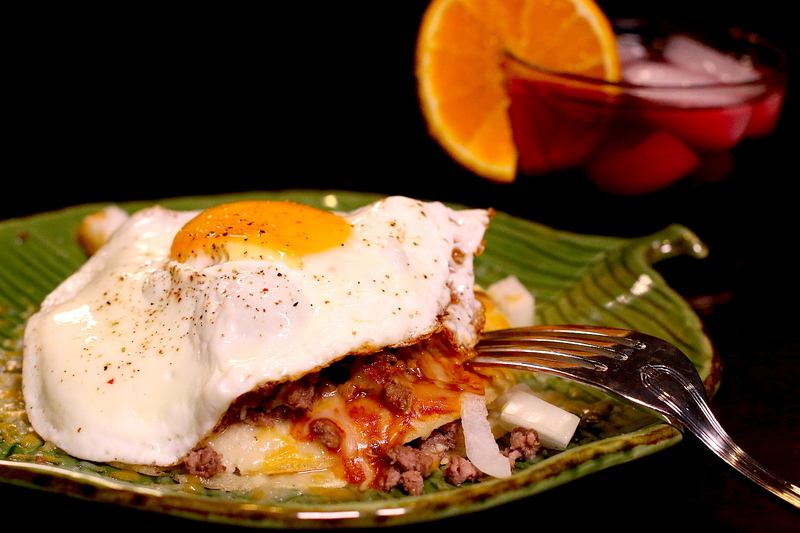 Never thought about putting an egg on my enchiladas. Great idea. Need to get my hands on some Hatch’s chili powder. Always use Gebhardts for my sauce. 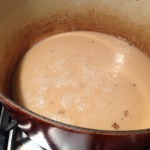 Best enchilada sauce ever! Sometimes I just put it on eggs and skip the other steps. Each time we have “grandpas” enchilada sauce, we say a thank you to the Evatt’s for introducing us to the deliciousness.